The BNP Paribas Open in Indian Wells announced their wild cards selections today, and they are an interesting mix of young and old. Sloane Stephens, who qualified and won a round in the tournament last year and Lauren Davis, both 17, will join Jill Craybas, Vania King, Christina McHale, CoCo Vandeweghe and India's Saniz Mirza in the main draw. Eighteen-year-olds Ryan Harrison and Bernard Tomic of Australia received main draw wild cards, as did James Blake, Japan's Kei Nishikori, and Canadian sensation Milos Raonic. I don't know why there are only five men's wild cards and seven women's. It is especially mysterious that the article announcing the wild cards says there is one remaining wild card to be granted on the women's side, but says nothing about any additional wild cards for the men. As I reported last night, Steve Johnson and Maria Sanchez of USC received qualifying wild cards. Madison Brengle, Madison Keys, Monica Puig of Puerto Rico and Sabine Lisicki of Germany were also given qualifying wild cards. Other men's qualifying wild cards went to Ryan Sweeting (should not have needed one given his ranking), Greg Ouellette and Mark Philippoussis of Australia. The pre-qualifying winners, one man and one woman, will also receive a qualifying wild card. I spent several hours today watching the first round of the YP Challenger in Dallas via the live streaming available via frontrowtennis.com. Qualifier Jarmere Jenkins of the University of Virginia played very well in his 6-4, 4-6, 6-3 loss to Matthew Ebden. After a very close opening nine games, Jenkins was broken serving at 4-5 in first set when he double faulted at 30-40. He shook off that disappointment to take the second set from the 191st-rank Australian, but was broken early in the third and could not cash in on any of his chances to get back on serve. The commentators mentioned several times how impressed they were with Jenkins' attitude and competitiveness when he was down 4-1 in the third. Unfortunately technical difficulties kept me from watching the final game of the match, but Ebden did serve it out. Wild card Jack Sock overwhelmed Rik De Voest of South Africa 6-4, 6-2, even though he didn't serve particularly well. It must be said that De Voest didn't play well, but part of that was because Sock had him defending from the beginning, hitting forehand winners from just about everywhere. Sock stumbled a bit leading 5-1 in the first set, losing his serve at love at 5-2, but it didn't seem to bother him. Sock broke the 160th-ranked De Voest in the opening game, took a 4-0 lead, and was never really threatened, although he did need three match points before earning the win. After Sock, Virginia's Alex Domijan took on No. 4 seed Rainer Schuettler of Germany. I didn't see the entire match, but Domijan stayed with the former Top 10 player in the first set before being broken at 5-6. I don't know what the second set score was (live scoring isn't working anymore), but Schuettler did win in straight sets. The Tennis Recruiting Network has added a second rating during the year, not just in the fall, but now also in the spring. Although the numerical ranking is updated weekly, the star and blue-chip designations were previously adjusted only once a year. As of today, that is no longer the case. For more on the change, see this explanation. Although it hasn't yet been formally announced, two University of Southern California players have been awarded wild cards into the qualifying for the upcoming BNP Paribas Open in Indian Wells. Senior Maria Sanchez and junior Steve Johnson will have the opportunity to compete among the world's best players when qualifying begins next month. The women's qualifying starts on Monday, March 7; the men's qualifying begins on Tuesday, March 8. There is also a pre-qualifying tournament that begins on March 2. The winner of the men's and women's tournaments will also received a qualifying wild card. For more details, see the tournament website. At the Blue Gray National Tennis Classic today, the No. 2 seeds in both the men's and women's draws collected the winners' trophies. Pepperdine beat No. 3 seed Auburn 4-0 for the men's title, their second in the 28 years the Blue Gray has been a team tournament. The Waves' Sebastian Fanselow was named tournament MVP. For details, see pepperdinesports.com. Notre Dame took the women's title with a 4-0 victory over top seeded Virginia. This is the first year that women have competed in the event. Kristy Frilling of the Fighting Irish was named the Most Valuable Player. For more, see the Notre Dame athletic website. For the draws and results for all three days of competition, see the tournament website. Thanks to Bill Kallenberg for the team championship photos from the event. I also wanted to pass along a link to the article about the No. 20 Cal men's 5-2 win over No. 5 UCLA in Los Angeles yesterday. With all the surprises this weekend, and the computers doing the team rankings for the first time, Tuesday's new rankings should be very interesting. Qualifying for the $50,000 Dallas Challenger at T Bar M was completed today, with University of Virginia's Alex Domijan and Jarmere Jenkins reaching the main draw with upsets of the top two seeds. Domijan beat No. 2 seed Gastao Elias of Portugal 6-2, 6-3, and Jenkins defeated top seed Raven Klaasen of South Africa 3-6, 6-3, 6-4. Former Oklahoma star Andrei Daescu of Romania also advanced to the main draw, beating former Aggie Brett Joelson. Both Domijan and Jenkins play their opening round matches on Monday. Jenkins will play Matt Ebden of Australia and Domijan faces No. 4 seed Rainer Schuettler of Germany. Wild card Jack Sock is also on Monday's schedule, playing Rik De Voest of South Africa. There should be live streaming with commentary beginning Monday at frontrowtennis.com. For draws and order of play, see the Pro Circuit page at usta.com. In the final of the $15,000 Brownsville Futures, No. 4 seed Nicholas Monroe captured the singles title with a 6-3, 3-6, 6-1 win over recent Baylor grad Denes Lukacs, an unseeded wild card. Number three seeds Greg Ouellette and Devin Britton won the doubles title with a 6-1, 6-3 victory over No. 4 seeds Boris Bakalov of Bulgaria and Nikoloz Basilashvili of Georgia. Ouellette and Britton did not need a match tiebreaker in any of their four victories. For more on today's finals, see this article from The Brownsville Herald. Two Big Ten teams avenged earlier losses to ACC opponents today, with the Michigan men surprising No. 6 Duke 4-3, and the No. 18 Northwestern women taking a 4-2 decision from third ranked North Carolina. Michigan had lost to Duke 7-0 during the ITA Kickoff weekend in Durham, and with the loss of the doubles point today, it didn't look as if the Wolverines were likely to reverse that outcome. But without Duke's top player, Henrique Cunha in the singles lineup (he did play doubles, clinching the point at No. 1 in a tiebreaker, where he suffered an injury according to the Duke website) and a different look to their own lineup, Michigan was able to win four of six singles matches. Jason Jung beat Christopher Mengel 4-6, 6-2, 6-4 at No. 2 singles to give Michigan the victory. Evan King, Barrett Franks and Justin Rossi earned the other three singles wins for the Wolverines. For more on the match, see mgoblue.com. In Evanston, the Northwestern women reversed last week's 4-3 loss to the Tar Heels in the quarterfinals of the Team Indoor, with both teams mixing up their lineups from just a week ago. Northwestern took the doubles point, and in singles, Kate Turvy, Belinda Niu and clincher Stacey Lee posted victories for the Wildcats. For details on the win, see nusports.com. In another women's match between top 20 teams, No. 20 Florida State beat No. 15 Georgia Tech 5-2 in an ACC match in Atlanta. For more on that see, seminoles.com. At the Blue Gray Tennis Classic in Montgomery, the top two women's seeds--No. 1 Virginia and No. 2 Notre Dame--advanced to Sunday's final, but there was a surprise this evening in the men's draw, with No. 3 seed Auburn ousting top seed Texas Tech 4-3. Auburn's Tim Puetz beat Gonzalo Escobar of Texas Tech at the No. 1 spot 2-6, 7-6, 6-4 to put his team in the final against No. 2 seed Pepperdine. For complete results, see the tournament website. The qualifying for the $50,000 Dallas Challenger got underway today, and there were a surprising number of byes. Perhaps it's the two Futures in Texas, with the Brownsville tournament just finishing and the Harlingen tournament just beginning, as well as a Futures in Canada next week, but I would have expected a better qualifying field. Virginia's Alex Domijan and Jarmere Jenkins have reached the final round of qualifying (with one bye and one win today). Domijan will face No. 2 seed Gastao Elias of Portugal in a rematch of the 2007 Eddie Herr Boys 18s final for a place in the main draw. Jenkins plays top seed Raven Klaasen of South Africa. Juniors Mitchell Krueger and Dane Webb fell in second round matches today. Jack Sock, Denis Kudla and Bernard Tomic have received main draw wild cards. For the tournament notes, as well as qualifying results and both draws, see the Pro Circuit page at usta.com. 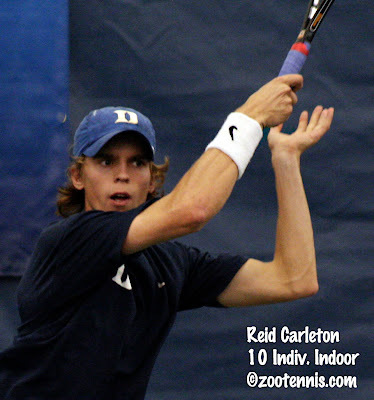 My article about Trice Capra's choice of college and Duke is up today at the Tennis Recruiting Network. 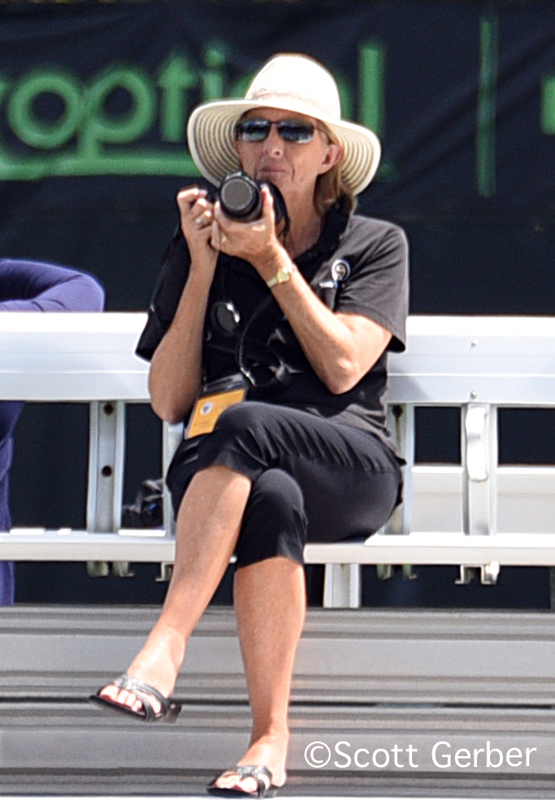 Because Capra has been such an outstanding junior for so many years--I first saw her play at the 2006 Easter Bowl, where she won the girls 14s title--and I have covered scores of her matches, I felt I knew quite a bit about her. But in our conversation in Midland earlier this month, I learned more about her Italian heritage, and the offer made by the tennis federation there. She also made it very clear that professional tennis is in her future; she really can't imagine doing anything else. I look forward to seeing her play often in the 2011-2012 season. The ITA released the results of the voting for the Indoor All-Tournament teams today. It's no surprise that champions Virgina and Stanford have the majority of the players. The ITA release for men is here; for women is here. There was more good news for Virginia tennis fans today, as the school announced that Michael Shabaz will be accompanying the US Davis Cup team as a practice partner for the upcoming tie in Chile. For more, see the release at virginiasports.com. On Tuesday, the USTA had a conference call with Davis Cup captain Jim Courier, and my question, as with any Davis Cup or Fed Cup call, was about the practice partners. Because the US is taking five veteran players--Sam Querrey, John Isner, Andy Roddick and the Bryan twins--to the March 4 tie in Chile, I asked Courier if they were taking any other practice partners and he told me Jay Berger was handling that. I learned today that Jordan Cox will be the practice partner. Depending on their health, and the Bryans results in Acapulco, the team is expected to be in Chile this weekend to prepare. The complete transcript of the call can be found here. BBC America examines the issue of international players in US college tennis in this article, posted today. A companion piece, which features opinions from coaches, former coaches and other experts, can be found here. Most of you know by now that I'm against any quotas, but I'm always willing to listen to ideas that can help more Americans earn places in Division I tennis lineups. Two of the top American college players, both of them Floridians who are sophomores at the University of Florida, are the subject of these two features. Sekou Bangoura Jr. is in the USTA's College Spotlight, and this article from the Naples Daily News goes into detail about Lauren Embree's wrist surgery and her ongoing recovery. Head coach Roland Thornqvist says that Embree is about 85%, even though she is undefeated in singles in dual match play this season. Not too many players earn their first professional point in their first try (it's actually not even possible for girls, who must play three events before being ranked), but Harrison Adams will be on the ATP computers in a couple of weeks after a victory today in the $15,000 Brownsville Futures. The 16-year-old Adams, a wild card who trains at Newcombe's Tennis Academy, beat former UNLV Rebel Joel Kielbowicz, a qualifier, 6-4, 3-6, 7-6(1). On Thursday, Adams will play former Orange Bowl and Australian Open boys champion Yuki Bhambri of India, the No. 8 seed, who beat Great Britain junior Oliver Golding in the first round. The other juniors in the main draw, wild card Shane Vinsant and qualifers Christopher Haworth and Marcos Giron, lost their first round matches today. UCLA recruit Giron and Eric Johnson, who has committed to USC, won their first round doubles match and will play No. 3 seeds Devin Britton and Greg Ouellette in Thursday's quarterfinals. Complete results can be found at the Pro Circuit page at usta.com. At the $25,000 ITF Women's Circuit event in Australia, Ashleigh Barty, the 14-year-old who is held in very high regard by knowledgeable observers in that country, beat top seed Kumiko Iljima of Japan in the first round. Barty, a wild card, beat the 28-year-old, ranked 214 in the world, 6-3, 6-3. The tournament is one of the few ITF events played on grass. American Gail Brodsky is also in the draw there, and won her first round match. TennisAustralia posted this article on the results there. For complete draws, see the ITF Women's Circuit website. While visiting that website, I noticed the article posted today on Monica Puig's win in the Surprise $25,000 event last week. It links to an explanation of the junior exempt program, which also features a list of the ranking cutoffs for all the ITF-supervised tournaments in previous years. This is valuable information for determining where a young player with only a few WTA points might be able to receive entry without a wild card. Because the Blue Gray National Tennis Classic moved from its traditional mid-March place in the calendar, I won't be able to attend this year (I was able to make the finals of the last two tournaments immediately following the USTA 18s Spring Nationals), which is disappointing, because the tournament will feature both men and women this year in Montgomery, Alabama. Instead of 16 men's teams, there will be eight men's and eight women's teams, including, as usual, the Alabama and Auburn teams. Texas Tech is the top seed in the men's tournament, with Pepperdine No. 2. Virginia is No. 1 in the women's event, with Notre Dame No. 2. The tournament begins on Friday and runs through Sunday. For complete draws, see the tournament website. For more on the tournaments, see the Tennis Europe website. The Smash Cup, which awards a qualifying wild card into the WTA Premier Tournament Family Circle Cup in Charleston in April to the Girls 18s winner, concluded yesterday, and 15-year-old Josie Kuhlman was the unexpected champion. Kuhlman, who is coached by former ATP Top 5 player Brian Gottfried, was unseeded in the field, which saw some late withdrawals, but still included top seed Caroline Price, the 18s clay court champion, and No. 2 seed Kaitlyn Ray, a blue chip recruit joining UCLA in the fall. Kuhlman beat Price in the round of 16, No. 5 seed Kendal Woodard in the quarterfinals and No. 4 seed Taylor Davidson in the semifinals. In the final against Leyla Erkan, another 5 seed, Kuhlman won the match, and the wild card, by a 6-3, 6-1 score. Kuhlman didn't lose more than three games in any set in her six victories. For more on Kuhlman and the match, see this article in Charleston's The Post and Courier. The complete draws can be found at the TennisLink site. In the ITF Grade 4 in Jalisco, Mexico last week, second seed Julia Elbaba took the singles and doubles titles. Elbaba beat top seed Annie Mulholland 6-2, 4-6, 6-3 in the singles championship match, and also topped Mulholland in the doubles final. Elbaba and Camila Fuentes, the No. 4 seeds, beat Mulholland and Ana Lorena Belmar of Mexico, seeded second, 5-7, 7-6(6), 10-8. Richard Del Nunzio reached the final, where the third seed lost to top seed Juan Pablo Murra of Mexico 6-7(7), 7-6(4), 6-1. Del Nunzio did collect a winner's trophy in Jalisco however, as he and Daniel Khanin beat Everth Dzib Peraza and Edgar Lopez of Mexico in the doubles final 6-1, 6-2. For complete draws, see the ITF Juniors site. In the Grade 2 in Chile, 14-year-old Indy de Vroome of the Netherlands and Matias Sborowitz of Chile won the single titles. This week two Americans, Michael Rinaldi and Alexandria Stiteler, are the top seeds in the Grade 4 in El Salvador. A new set of team rankings are out post-Team Indoor, and although the top teams stayed with same, with Virginia men and Stanford women solidifying their No. 1 rankings with their championships, there was some significant shuffling. The USC men fell from 2 to 9, while the Duke men went from 17 to 6. On the women's side, the Virginia women reached the Top 10 for the first time in school history, climbing all the way from 23 on the basis of their two victories, over Baylor and Northwestern, at the Team Indoor. Baylor fell from 3 to 7, and UCLA dropped from 7 to 11. It is important to remember that these are still polled rankings, not computer rankings, which will debut next week. That can change positions dramatically, and for an explanation of why, see the the Frequently Asked Questions pdf on the ITA website. The ranking page at the ITA website can be found here. At the Division III Men's Indoor, No. 1 seed Emory took the championship with a 6-3 win over Washington University (St. Louis). From the recap on the Division III Tennis blog, it sounds as if Emory was nearly as dominant as Virginia was in the Division I Indoor. The Stanford women picked up right where they left off in May, winning the 2011 ITA Women's Team Indoor title to go with their 2010 NCAA championship. The Cardinal had beaten Florida 4-3 in Athens, with the match coming down to 5-5 in the third set of the last match on. Today in Charlottesville, Virginia, the ending was only slightly less dramatic, with two matches deep in the third set with Stanford clinging to a 3-2 lead. Tan got a late break and hold to claim a 7-5, 3-6, 6-4 win over Alex Cercone at No. 5 singles, leaving the final score 4-2 in Stanford's favor. The other match still on court was at No. 1 singles, between senior Hilary Barte of Stanford and Allie Will of Florida. With Tan and Cercone at 4-4 in the third of their match, Will was serving for her match with Barte at 5-4, but she was broken to make it 5-5. Cercone lost her serve, Barte held hers, and suddenly Stanford had edged ahead in both matches. Will forced a tiebreaker by holding in the pressure-packed 5-6 game, but Tan held after a nearly 10-minute final game to claim the victory. At the time the match was clinched, Barte was up 5-2 in the tiebreaker against Will. Stanford started out by winning the doubles point, which it had failed to do in the NCAA final, getting wins at the No. 1 and No. 3 positions, while Florida easily won at No. 2. Lauren Embree brought Florida even with a 6-4, 6-4 victory over NCAA MVP Mallory Burdette at No. 2, and the Gators took a 2-1 lead moments later, when Olivia Janowicz defeated Carolyn McVeigh 6-1, 6-1 at No. 6. Kristie Ahn made it 2-2, with a 6-4, 6-2 decision over Sofie Oyen at No. 3, and Nicole Gibbs put the Cardinal back in front with a 7-6(2), 6-3 win over Joanna Mather at 4. Cercone had battled back to force a third set, while Barte had done the same to assure another exciting battle between the two teams. With No. 1 Stanford playing at home in the NCAAs this May, they are certain to be favored for a repeat title and a sweep of the team championships in 2011, but Florida is likely to have a major say in whether that comes to pass. In this story from gatorzone.com, Florida head coach Roland Thornqvist says, "we have a championship in us." The Stanford story on the final is here. The tournament website page, with all the results, can be found here. In top-ranked Virginia's 4-0 victory over No. 3 Tennessee, all the drama came, as it turned out, in the doubles point. After JP Smith and Boris Conkic of Tennessee had taken an 8-4 decision over Alex Domijan and Michael Shabaz at No. 1, the Volunteers needed only one of the remaining two matches. Both went to tiebreakers, with Drew Courtney and Steven Rooda taking out Ed Jones and Matteo Fago at No. 3 by 9-8(4)score. Courtney and Rooda trailed 4-2 at the change of ends, but won the final five points of the tiebreaker, to make it 1-1. A similar scenario played out at No. 2 doubles, with Tennessee's Jarryd Chaplin and Rhyne Williams leading 5-3 in their tiebreaker with Jarmere Jenkins and Sanam Singh, before Jenkins and Singh ran off the final four points. With Williams serving at 5-6, he missed his first serve, and Jenkins cracked a winner off the return of his second to give Virginia the doubles point. It was the first time that Tennessee had lost the doubles point in 22 consecutive matches. The loss of the doubles point proved even more costly when Williams was penalized a game in his singles match for two audible obscenities after the doubles, and Tennessee quickly fell behind on nearly every other court as well. Even the return of Tennys Sandgren, who did not play doubles but did take the court for the first time in singles, having been out with an illness all weekend, did not provide a lift. An hour and 15 minutes after the singles had begun, they were finished, with Jenkins taking Fago at No. 4 6-1, 6-1, Shabaz defeating Williams at No. 1 6-2, 6-2 and Domijan clinching at No. 2 6-2, 6-4 over Smith. Virginia is now alone in the record books, as no team, not even the Stanford dynasties, has ever claimed four consecutive team indoor championships. Seniors Michael Shabaz and Sanam Singh will complete their Cavalier careers without ever experiencing a loss in the Indoor Championships. It was the third consecutive runner-up finish for the Volunteers, added to last year's team indoor loss to Virginia, and the loss to USC in the NCAA final last May. For more on the Virginia win, including a video, see virginiasports.com. The Tennessee perspective can be found here. 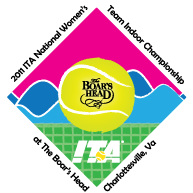 The ITA tournament website is here. The rematch that everyone has been waiting for became a reality today, with No. 1 Stanford and No. 2 Florida winning semifinal matches in the ITA Women's Team Indoor to set up their first meeting since the Cardinal beat the Gators 4-3 in last year's NCAA final. The teams aren't the same of course, with both lineups containing prize freshman blue chips: Florida with Alex Cercone, Sofie Oyen and Olivia Janowicz; Stanford with Kristie Ahn and Nicole Gibbs. But even with the new players, both teams remained at the top of the rankings this and have demonstrated this weekend why they are favored to meet again in the NCAA final. Today in Charlottesville, Florida downed No. 6 Duke 4-1, its second win over the Blue Devils in the past week, and Stanford took out No. 4 North Carolina 4-0, in a match that was much closer than the score suggests. In fact, I'm linking to both Stanford's and North Carolina's accounts of the match, because I think the Stanford article gives the impression that it was an easy win for Stanford, which it definitely was not. Unfortunately, neither school provides partial scores, but they are available at the tournament website by clicking on the LiveStats links. In spite of their many accomplishments as two of the most storied programs in women's tennis, neither Stanford or Florida had reached the Indoor final in quite a few years. On some occasions, they have chosen not to participate, which was the case with Stanford last year, but it's the first time that the Cardinal have been in the final since 2006, and the first time for the Gators in the final since 2003. Both teams appear to be healthy heading into Monday's final, but the same cannot be said for the men's final Monday between No. 3 Tennessee and No. 1 Virginia. Tennessee's Tennys Sandgren has been ill while in Seattle, and since playing in doubles against Georgia on Friday, has been unable to compete. That didn't stop the Volunteers from reaching the Indoor final for the second straight year however, as today they defeated No. 15 Duke 4-2 without getting any points from their top three positions. Virginia, which is seeking an unprecedented fourth consecutive men's Team Indoor championship, played very late into the night on Friday and Saturday, but they came away with 4-1 victories over Washington and Illinois. Today, playing in the afternoon, Virginia got another 4-1 victory, taking out No. 4 Ohio State in very efficient fashion. I encourage all of you to head over to the Tennessee men's tennis homepage on Monday, where you can find Amanda Pruitt's Live Blog. The Tennessee men's tennis SID has made that the place to be for college tennis fans, and it sure beats watching the scores change (and manually refreshing) on the Washington website. The webcams are better than nothing, but without sound, matches are difficult to follow, and you can't get the overview that Amanda provides. The match is scheduled to start at noon Pacific, 3 p.m. Eastern. The ITA tournament page is here. In the rain-delayed semifinals of the $25,000 Women's Pro Circuit event in Surprise, Arizona, Monica Puig of Puerto Rico beat Chichi Scholl 7-5, 6-4 to earn a berth in the final, and there beat No. 5 seed Lenka Weinerova of Slovakia 6-4, 6-0 to capture her second professional title. The unseeded Puig received entry into the main draw by virtue of a junior exemption she earned by finishing in the Top 10 in the ITF World Junior rankings last year. Shuko Aoyama and Remi Tezuka of Japan won the doubles title. For complete results, as well as the qualifying results for the upcoming $15,000 men's Futures event in Brownsville, Texas, see the Pro Circuit results page at usta.com. In the second round of the ATP Delray Beach International qualifying, Jack Sock lost to Ryan Sweeting 6-4, 6-0. Shinann Featherston needed to win a third set tiebreaker against Georgia to put the North Carolina Tar Heels in the field at the ITA Women's Indoor three weeks ago. Tonight in Charlottesville, Featherston clinched her team's 4-3 win over two-time defending champion Northwestern to earn a spot in Sunday's semifinal. It was a rematch of last year's Team Indoor final, which Northwestern won 4-2. This year however, it was North Carolina who came into the tournament as the No. 4 seed, while Northwestern was the underdog, a reversal of their roles in 2010. North Carolina has always had a reputation for outstanding doubles play, however so it was a bit of a shock when they dropped a very long doubles point to the 20th-ranked Wildcats. The score was tied at 2-2, with the top three positions still undecided, but Northwestern's Maria Mosolova completed her 6-1, 7-6 win over Zoe De Bruycker at No. 1 to give her team the 3-2 lead. Needing to win at both No. 2 and No. 3 singles, North Carolina did just that, with Jelena Durisic finishing a comeback win over Kate Turvy of Northwestern 2-6, 6-4, 6-4 and Featherston, a junior, quickly following with a 7-6, 7-5 decision over freshman Belinda Niu. North Carolina will play No. 1 seed Stanford in Sunday's semifinals, after Stanford lost the doubles point, but had no trouble with No. 8 seed Michigan in singles, beating the Wolverines 4-1. In the other semifinal, No. 6 Duke will take on No. 2 Florida, in a rematch of a meeting that took place just last weekend, won by the Gators 4-2 in Durham. Duke has lost the doubles point in both of its wins; today against host Virginia, the Blue Devils got victories at 3, 4, 5 and 6 singles to earn a 4-2 win. Florida beat Clemson 4-0, but it wasn't an easy victory for the favored Gators, with four of the six singles matches going into three sets. 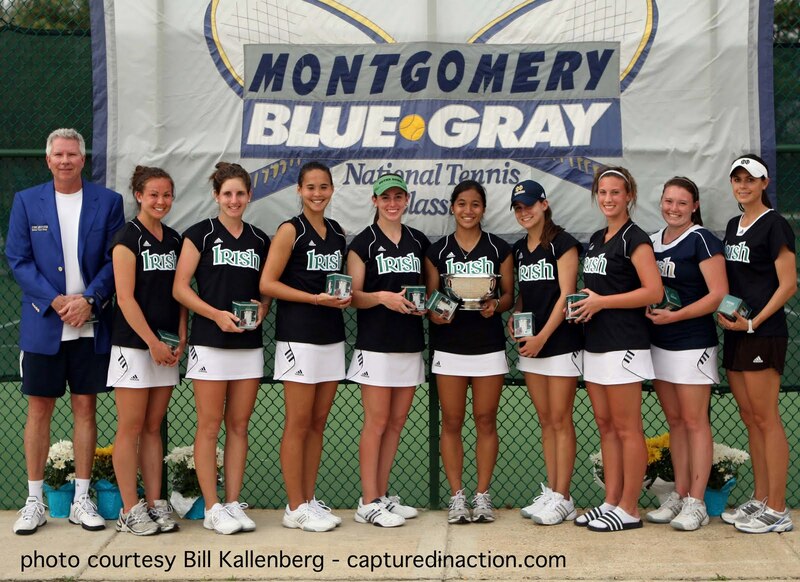 The ITA tournament page can be found here. In the men's Indoor championships in Seattle, three of the four semifinalists are known, but the fourth quarterfinal between Illinois and Virginia does not begin until midnight Eastern time. No. 3 Tennessee reached the Team Indoor semifinals for the third straight year, taking out No. 6 UCLA 4-1 in the first quarterfinal to be decided. They will play No. 15 Duke, who pulled their second straight upset Saturday afternoon. After beating No. 2 USC on Friday, Duke got by No. 10 Florida 4-1. In a match last week, Tennessee, who did not have Tennys Sandgren in the lineup today, beat Duke 7-0. In a match that finished less than a hour ago, No. 4 Ohio State lost the doubles point to another Big 12 foe for the second night in a row, but came back to beat No. 5 Texas 4-1, getting singles wins from Buchanan, Allare, Novak and newcomer Van Engelen. 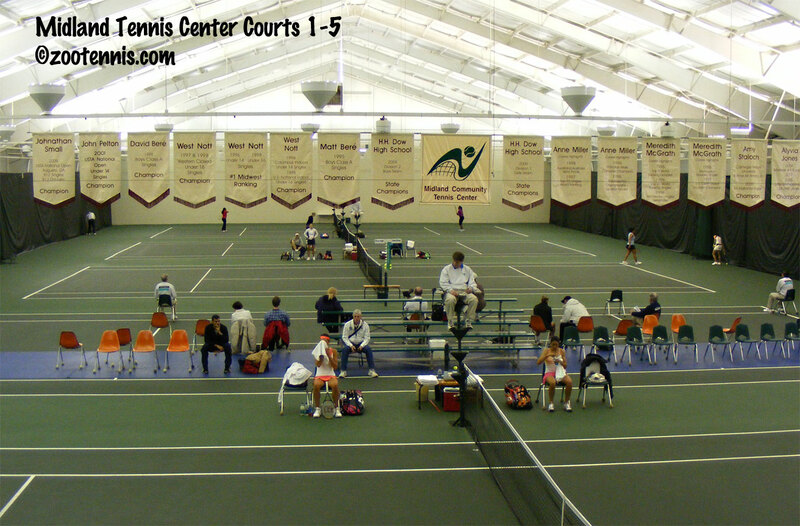 The ITA men's indoor tournament page is here. Today in Delray Beach, wild card Jack Sock won his opening match in qualifying 6-4, 6-4 over Austria's Alexander Peya. Sock plays Ryan Sweeting on Sunday. Bjorn Fratangelo lost his match to Matthew Ebden of Australia 6-2, 6-3. Sock and Donald Young have received a doubles wild card into the main draw. Ryan Harrison received a wild card into the main draw in singles when Juan Martin Del Potro did not need his wild card, instead receiving a special exemption entry for reaching the semifinals in Memphis. For the results and draws, see the tournament website. In Acapulco, both Julia Cohen and Irina Falconi lost their opening matches in qualifying for the WTA event there. For complete results, see the tournament website. Rain interrupted the semifinals at the $25,000 Pro Circuit tournament in Surprise, Arizona. Monica Puig and Chichi Scholl had not yet completed the first set of their match when play was postponed until Sunday. For the draw and order of play, see the Pro Circuit page at usta.com. Starting at 9 o'clock this morning and continuing well into the wee hours of Saturday, there has been one exciting match after another at the Men's and Women's Team Indoor Championships. It's hard to picture any of the subsequent contests equaling the Virginia women's 4-3 victory over No. 3 Baylor however, with junior Lindsey Hardenbergh saving five match points and getting an overrule in her favor in the final tiebreaker to come away with a 6-3, 5-7, 7-6(8) victory and the fourth point against Baylor's Diana Nakic. With the score tied at 3-3, the dual match came down to the match at No. 2 singles. Hardenbergh had led 6-3, 5-1, but Nakic rallied to win six straight games to force a third set. Nakic led 5-1 in the final set and had two match points at 5-2, but Hardenbergh rallied and took a 6-5 lead. Hardenbergh had three match points in the 6-5 game, but Nakic saved them and forced a decisive tiebreaker. In the tiebreaker, Nakic had three match points as she took a 6-3 lead. After Hardenbergh saved the first of those three match points, Nakic double-faulted to make the score 6-5 in the breaker. On the next point Hardenbergh hit a shot down the line that Nakic called out, thinking she had clinched the match for Baylor. However, the call was overruled and since it was Nakic’s fourth overrule of the match, the game penalty gave Hardenbergh the tiebreaker and the victory. For the complete results from the Baylor - Virginia match, see virginiasports.com. Hardenbergh's heroics overshadowed a slightly less dramatic reversal by Duke's Reid Carleton, who came back from two match points down to USC's Daniel Nguyen to take a 5-7, 7-6(2), 6-3 victory at No. 2 singles, which gave the No. 15 Blue Devils a 4-3 victory over the second-seeded Trojans. In other women's action today, Clemson beat No. 7 seed UCLA 4-3; No. 2 Florida downed Miami 4-1 and No. 6 Duke defeated Tennessee 4-1. In the early evening matches, two-time defending champion Northwestern blanked No. 5 Cal 4-0, and No. 4 seed North Carolina took out Washington 4-2, leaving the Pac-10 still searching for its first win in the opening round. They got it with No. 1 Stanford easily getting past Arkansas 4-0. No. 8 Michigan beat Georgia Tech 4-1. The draws can be found on the ITA website. In other men's first round action, No. 10 Florida squeezed by No. 7 Stanford 4-3, No. 6 UCLA cruised past No. 11 Louisville 4-1, and No. 3 Tennessee beat No. 14 Georgia 4-2 despite losing four first sets in singles. No. 5 Texas beat No. 12 Kentucky 4-2 tonight, meaning there has yet to be a shutout recorded in the men's draw in five decisions. Texas will play No. 4 Ohio State on Saturday. The Buckeyes lost the doubles point to No. 13 Texas Tech, but won the match 4-1. The men's tournament page at the ITA site is here. I want to get this posted, even though there are two men's matches yet to be finished, but I will add to the post either later tonight or tomorrow morning. NOTE: No. 1 Virginia defeated No. 16 Washington 4-1, and No. 8 Illinois topped No. 9 Texas A&M by the same score in the final two first round matches in Seattle. There were again some technical difficulties, but Granger Huntress and I managed to complete our Skype conversations about the upcoming ITA Team Indoor Championships. To listen to the women's edition, click here. Live scoring can be found at the ITA's tournament page. Our conversation about the men's tournament can be found here. The links to live streaming and scoring can be found at the ITA's tournament page. Today in the Surprise, Arizona's 25K, Australian Open girls finalist Monica Puig won her second round match with AOYAMA, Shuko Aoyama of Japan 6-1, 6-2 to advance to the quarterfinals. There are no seeds remaining in Puig's half of the draw, and she will play Nadejda Guskova of Russia on Friday. For complete results, see the Pro Circuit page at usta.com. A new sports management agency is Las Vegas Nevada sent out a release regarding its signing of Vavarva Lepchenko, and it also included the information that Julia Cohen was a client. Last spring the 21-year-old, who played one year at Florida and another at Miami, was competing sporadically for the Division II California of Pennsylvania team, but the news that she has signed with an agent now makes her ineligible to play in college. I spent a couple of hours this afternoon on a podcast with Granger Huntress of the Texas College Tennis blog, discussing the ITA Team Indoor Championships, which start on Friday. We tried a podcast prior to the Kickoff Weekend at the end of January, but there were some technical difficulties, so that podcast wasn't released. It was good practice for us however, and this time we spoke first about the women's teams and then in a separate segment, the men's. We didn't disagree on much, and Granger being the persuasive person he is, was able to get me to make predictions, which I usually avoid. I doubt any of our picks will surprise you, although I hope we were able to provide some informed reasons for failing to pick any big upsets. One thing I did want to mention concerns the lineups. We were given access to the lineups after they were finalized (post challenges), and we are grateful for that, but they are not available online, which I think is a mistake. I have been told that the coaches voted not to make the lineups available. I do not know why that would be the case, but it is not the way to build interest in the sport, and I hope they will reconsider this policy. There are many passionate fans out there who would love to be talking right now about the lineup the Stanford women will be putting on the court Friday, or who is going to play in the No. 1 spot for the Georgia men. The Virginia men's doubles lineup would also be good for a conversation or two. I will link to the podcasts once they become available, probably Thursday, but if you'd like to make predictions, please feel free to do so in this post. The women's draw is here; the men's draw is here. The was an article today in the Seattle Times about the men's event, with quotes from Washington head coach Matt Anger. "I don’t think there’s any rush necessarily to turn pro,” Moller said. “I think a lot of people are saying, ‘Oh, you should only stay one year and turn pro.’ But I’d be quite happy if he stayed all four years and got his degree." It was a good day for juniors at the $25,000 Pro Circuit women's tournament in Surprise, Arizona today. Wild card Liz Jeukeng beat former LSU All-American Megan Falcon, a qualifier, 1-6, 6-2, 7-5; lucky loser Eugenie Bouchard of Canada reaached the second round with a win over former UCLA player Liz Lumpkin, also a lucky loser. Qualifier Krista Hardebeck beat Lisa Whybourne 6-1, 6-2, and Monica Puig, who received entry as a junior exempt, beat No. 6 seed Camila Giorgi of Italy 6-4, 2-6, 7-5. For the complete results, see the Pro Circuit page at usta.com. It's been pretty quiet in junior tennis since the Australian Open, but American juniors have been competing in Mexico and South America the past few weeks. At the Grade 4 in Mexico City last week, Camila Fuentes won the girls singles and doubles titles. 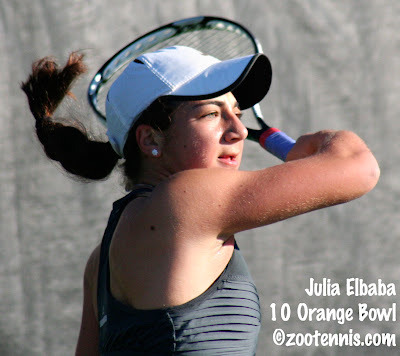 Although the ITF previously listed the 15-year-old as representing Mexico, and the Tennis Recruiting Network still does, she is now appearing in draws with USA next to her name. Her ITF profile shows she has played primarily in Central America and Mexico in the past year. 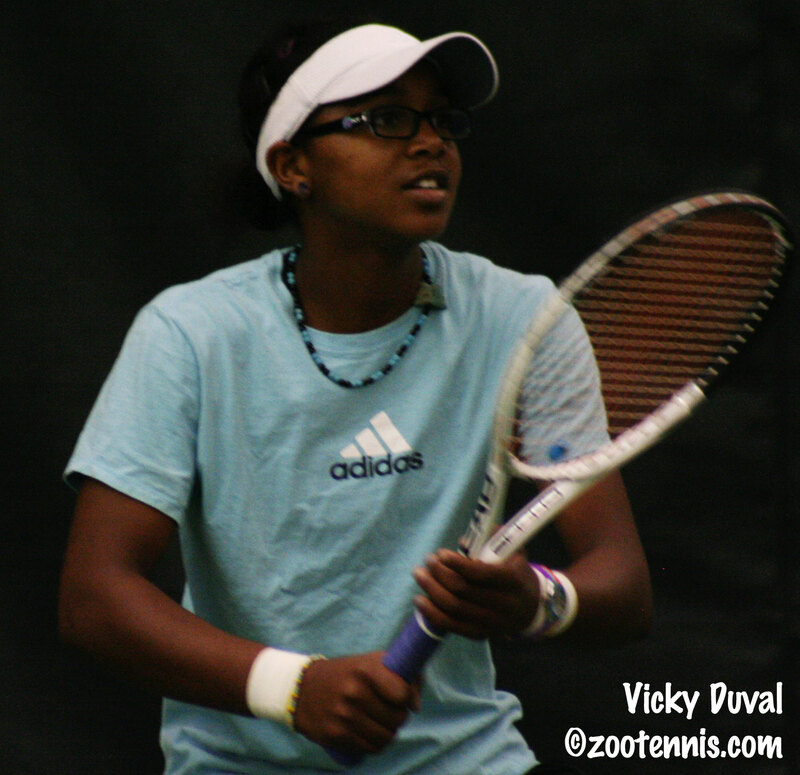 She did win a USTA National Open in the 14s back in July of 2010 in El Paso. This is a long-winded way of saying that I am not familiar with her, but I look forward to seeing her play, perhaps at the Easter Bowl, this year. At the Grade 2 in Bolivia last week, Hugo Dellien won the title in his home country to put his singles record in ITF juniors at 29-2 this year. He has won four of the six tournaments he has entered this year, and lost in the semifinals and finals of the other two. And that's just in singles. He has also won the doubles title in four of the five tournaments he's competed in. Last week, Dellien and Boris Arias, also of Bolivia, were the No. 2 seeds, but they didn't lose a set in the tournament, and in the final took out top seeds Connor Farren and Daniel McCall of the United States 6-3, 7-5. The best U.S. showing in singles was Roberto Cid, who reached the boys semifinals, losing to Dellien. The U.S. did claim a doubles championship in Bolivia however, as Dhanielly Quevedo of the U.S. teamed with Lina Gjorcheska of Macedonia to win the girls title. Quevedo and Gjorcheska, the No. 3 seeds, beat top seeds Giovanna Manifacio of Mexico and Stephanie Nauta of the U.S. 6-7(5), 6-3, 10-6. The girls singles title went to 14-year-old Ilka Csoregi of Romania, the 16th seed, who defeated Gjorcheska 3-6, 6-4, 6-4 in the final. It was Csoregi's second straight Grade 2 win--she also won the Inka Bowl the previous week--and her ITF ranking has risen to 81. She is also in the draw this week in Chile, for the Grade 2 there. Americans playing in Chile are: Connor Farren, Robert Livi, Dan McCall, Luis Elizondo, Jennifer Brady, Quevedo, Blair Shankle, June Lee and Natalia Maynetto. In Jalisco Mexico's Grade 4 this week, Americans Annie Mulholland and Julia Elbaba are the top two seeds in the girls draw. Richard Del Nunzio, Karim Arem, and Alex Fennell are seeded Americans in the boys draw. For complete draws, see the ITF Junior website. The qualifying for next week's ATP tournament in Delray Beach begins Saturday, and in this update from the Florida section, it names Jack Sock, Eric Hechtman, who played for the University of Miami, and Stefano Ianni of Italy as the three wild cards. Although he is not mentioned, I understand that Bjorn Fratangelo, who won last year's 18s Clay Courts (Sock won it in 2009), is also in the qualifying via the wild card that is given to the Clay Court champion. Also check out my brief article included in the above update on Jeff Dadamo and Austin Krajicek of Texas A&M, which appeared in a recent Florida edition of TennisLife. 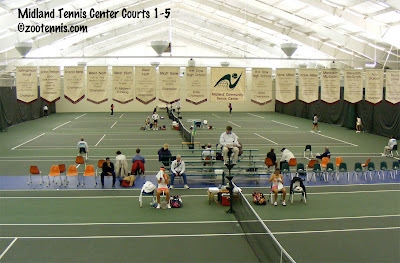 My weekly article for the Tennis Recruiting Network is a bit of a change of pace for me, as I look at the "bigger picture" at the Dow Corning Tennis Classic in Midland. The tournament's relationship with the community is a very special one, and the number of elementary through high school students exposed to the sport during its many programs is staggering. And if you doubt that a brief encounter with a touring pro can have any lasting impact on a youngster, read the story. You'll see just how motivating one such meeting was for six-year-old Kelli Close. With the ITA Team Indoor Championships just days away, this week's team rankings are especially important. There was no change among the top six for the men or the women, with Virginia and Stanford maintaining the top spots. Following Virginia in the men's rankings are Southern California, Tennessee, Ohio State, Texas and UCLA. Florida's loss to Illinois on Saturday night likely cost the Gators a top 8 seed in Seattle, and the Illini, now ranked ninth, may be seeded eighth with the absence of eighth-ranked Baylor at the Team Indoor. I always like to point out the Top 16 teams who are not going to be in the field at the Indoor, and among the men, that includes Baylor, who elected not to particpate in Kick-off weekend, and Georgia Tech, whose win over Georgia last Saturday catapulted them from 21 to 15 in this week's rankings. On the women's side, the top 8 remained the same. Stanford is followed by Florida, Baylor, North Carolina, Cal-Berkeley and UCLA. Top 16 teams not competing in Charlottesville this weekend include Georgia (10), Vanderbilt (14), Southern California (15) and Florida State (16). It's worthwhile to remember that these rankings are still done by polling. It is not until March that the computer takes over the process of ranking the teams. 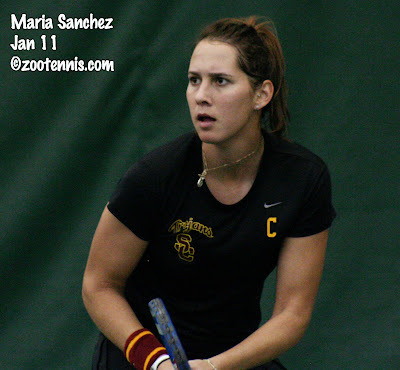 There was a change at the top of the individual rankings, with USC senior Maria Sanchez taking over the top spot from Jana Juricova of Cal-Berkeley. Juricova is now fourth, with Stanford's Hilary Barte second and Notre Dame's Kristy Frilling third. Tennessee sophomore Rhyne Williams remains at the top of the men's rankings, followed by Virginia's Alex Domijan, Kentucky's Eric Quigley and USC's Steve Johnson. Virginia has five players in the Top 25. Texas A & M's Jeff Dadamo and Austin Krajicek are still No. 1 in men's doubles, and Florida's Sofia Oyen and Allie Will keep their spot atop the women's doubles rankings. With Sanchez taking the top spot in women's singles, all four of the USTA/ITA Individual Indoor Champions are now ranked No. 1. For the complete rankings, see the ITA website. Will is the subject of the most recent edition of the USTA's college spotlight. With Lauren Embree's wrist surgery keeping her out of action in the fall, Will has taken Embree's place at the top of Florida's lineup and has not come close to dropping a set in her six dual match wins at No. 1 this season. The Tennis Mom has a new guest post up, with longtime coach Steve Smith addressing the question of why so many juniors frequently change coaches. Although I think Smith could have boiled down his very long answer to a more effective 1000 words, he touches on several crucial issues about the triangle of parent, coach and young player. Coach swapping becomes like musical chairs. It is a merry-go-round. The parent, based on various day-to-day circumstances, can only go so far down the road to find a new coach. It is unlikely the parent goes on a national search for another coach. The next coach is right around the corner. The grass is not usually any greener on the other side. But parents and players seek out someone who will tell them what they want to hear and give them what they want. When the new coach does not work out, if they live in a densely populated area, the parent can easily find another coach. Ours is not a society well-versed in "making do." We want the best, and we want it now, and we are optimistic that it's possible. That's not necessarily a bad cultural trait, optimism, but it must be based in reality. Tennis is hard, mastery takes thousands of hours, and even the best coach can only direct, he or she cannot create. Please feel free to comment here(please use a name when you do so) or on The Tennis Mom blog. 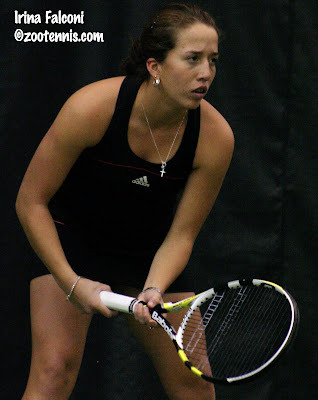 2010 ITA Player of the Year Irina Falconi was beaten in the Dow Corning Tennis Classic final today in Midland, Michigan. 2009 champion Lucie Hradecka of the Czech Republic won the title 6-4, 6-4, breaking serve once in each set and not facing a break point on her serve. Jamie Hampton and Anna Tatishvili won the doubles championship when Falconi and Alison Riske were unable to compete due to Riske's fever. Falconi's next tournaments will be the WTA events in Acapulco and Monterrey later this month. For Josh Rey's account of the Midland final, see this post at Tennis Panorama. Ashley Weinhold, who won the USTA girls 18s National championship in 2007, captured the $25,000 Pro Circuit singles title in Rancho Mirage, beating No. 5 seed Kristyna Pliskova of the Czech Republic 6-3, 3-6, 7-5. It the first professional singles title for the 21-year-old since 2006, when she won a $10,000 event in her home state of Texas. For more on her comeback win, see this release from the tournament. Complete draws can be found at the Pro Circuit page at usta.com. The first round qualifying results from the $25,000 tournament in Surprize, Ariz. are also available there. Today in Memphis, wild card Beatrice Capra lost to Alexa Glatch in the first round of the Cellular South Cup 6-2, 6-0. Wild cards Catherine Harrison and Ajla Tomljanovic will play Monday. For the complete order of play, see the tournament website. Former University of Illinois All-American Kevin Anderson also plays Monday, taking on qualifier Robert Kendrick, who also developed his game in college, at Washington and Pepperdine. Anderson's alma mater had a big win last night, defeating No. 7 Florida 4-3, with the match coming down to No. 1 singles. For more on that match see fightingillini.com. I hope you have bookmarked Challenger Tennis to stay up-to-date on Futures and Challenger action around the world. He also does player spotlights, with his most recent an interview with former Texas All-American Dimitar Kutrovsky. The USTA's resident blogger Irina Falconi continued to impress at the $100,000 Dow Corning Tennis Classic, defeating No. 2 seed Rebecca Marino of Canada 6-2, 6-3 this afternoon to reach the final of the $100,000 Pro Circuit event in Midland, Michigan. The 20-year-old former Georgia Tech All-American will play three-time Dow Corning finalist Lucie Hradecka of the Czech Republic, who beat No. 7 seed Ksenia Pervak of Russia 6-4, 6-4 this evening. Falconi also reached the doubles final with Alison Riske, recording a 7-5, 7-5 victory over Gabriela Dabrowski and Whitney Jones. Falconi is still finding time to write her blog, and she answered my question about her comedic inspirations in the latest post. In Rancho Mirage, California, Ashley Weinhold reached the final of the $25,000 women's Pro Circuit tournament with a 6-4, 6-4 win over No. 4 seed Karolina Pliskova of the Czech Republic. The unseeded Weinhold has yet to lose a set in her four victories. She prevented an all-Pliskova final with the win, as Karolina's twin sister Kristyna advanced with a 7-5, 1-6, 7-6(3) victory over Lauren Albanese. The Pliskova won the doubles title today over lucky losers Nadejda Guskova of Russia and Sandra Zaniewska of Poland 6-7(6), 6-1, 10-5. For complete draws, see the Pro Circuit results page at usta.com. At the WTA Cellular South Cup in Memphis, future Duke Blue Devil Trice Capra will play her only her fourth main draw WTA match, the first three having been at the 2010 U.S. Open. Capra, a wild card, faces Alexa Glatch, who won two matches in qualifying to earn a main draw spot. The draws and order of play for the WTA and ATP combined event in Memphis can be found at the tournament website. There were a lot of close matches today in among Top 20 teams in Division I tennis, with the No. 2 Florida women traveling to No. 4 North Carolina the most attention grabbing. Florida took a 5-2 victory from the Tar Heels and with the win have certainly cemented their position as one of the top two seeds heading into next weekend's National Team Indoor Championships. The Georgia women also posted a road win over a perennial ACC contender today, defeating No. 9 Clemson 5-2. Since losing a heartbreaker to North Carolina two weeks ago, the Georgia women have beaten Georgia Tech and Clemson, and in a testament to their depth, have done it without getting a victory from Chelsey Gullickson at the top of the lineup. The big surprise of the day came out of Atlanta when Georgia Tech, ranked No. 21, posted a 4-3 win over No. 11 Georgia. It was the first time since 1988 that the Yellowjackets had beaten the Bulldogs, a streak that spanned 24 matches. Tech's Dean O'Brien saved two match points at No. 6 singles in the deciding match, beating Ignacio Taboada 4-6, 6-3, 7-5 to deliver the win in front of a big Alumni weekend crowd. The fifth-ranked Texas men traveled to Tallahassee to play No. 26 Florida State and escaped with a 4-3 victory. Other big matches still underway are No. 3 Tennessee vs. No. 14 Duke, and No. 7 Florida vs. No. 16 Illinois. The USTA announced today that former Mississippi State men's head coach Sylvain Guichard will join the Player Development staff as a National Coach for Women's Tennis. Guichard, who has been working at an Illinois club the past three years, will be based in Boca Raton. Michael Redlicki, who won the 16s title in Kalamazoo in 2010, frequently mentioned his relationship with Guichard as a key to his outstanding results last summer. For the complete release, see usta.com. Today in Midland, Irina Falconi recorded victories in both singles and doubles to reach the semifinals in both draws at the Dow Corning Tennis Classic. Falconi beat unseeded Madison Brengle 6-2, 6-3 in singles this afternoon, and with Alison Riske, defeated the No. 4 seeded doubles team of Sorana Cirstea and Anastasia Pivovarova 6-3, 6-4. Falconi will play No. 2 seed Rebecca Marino of Canada in tomorrow's semifinal. The two 20-year-olds could have been teammates at Georgia Tech, as Marino committed to the Atlanta school where Falconi spent two years, but the Canadian ended up passing on college as her ranking improved. Falconi and Riske play the unseeded team of Gabriela Dabrowski and Whitney Jones in one doubles semifinal. If there is a jinx associated with blogging for usta.com, Falconi is proving it is nothing more than a coincidence with her success this week. You may send her a question at player@usta.com. Her current entry can be found here. The qualifying has started for the WTA Cellular South Cup in Memphis, which presented a problem for two of the Midland quarterfinalists, Brengle and Alexandra Stevenson. Neither was able to make their first round qualifying matches today at the Racquet Club of Memphis, so they have been postponed until Saturday. 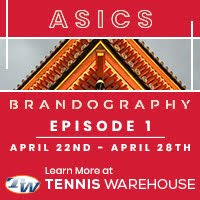 In the six matches that did take place, Heather Watson, Michelle Larcher de Brito, Alexa Glatch, Katie O'Brien, Stephanie Foretz Gacon and Anna-Lena Groenefeld advanced to the final round. 2010 USTA Girls 18s Clay Court champion Caroline Price made use of the qualifying wild card she received for that title, and got off to a great start against O'Brien, but lost the final eight games of the match, losing 1-6, 6-2, 6-0. Complete results from today are available here. The women's main draw includes one wild card previously announced, Catherine Harrison, and two others, Beatrice Capra and Ajla Tomljanovic. Harrison plays Sorana Cirstea of Romania, Capra will face a qualifier, and Tomljanovic will meet Evgeniya Rodina of Russia. The complete draw can be found at the tournament website. The men's qualifying draw will come out later tonight, but one of the wild cards has been announced, with University of Memphis player Joe Salisbury the recipient. At the $25,000 women's Pro Circuit event in Rancho Mirage, Ashley Weinhold and Lauren Albanese have reached the semifinals, where they'll each face a Pliskova twin. Ellen Tsay and Nicole Melichar reached the doubles semifinals, but were beaten today by the Pliskovas. 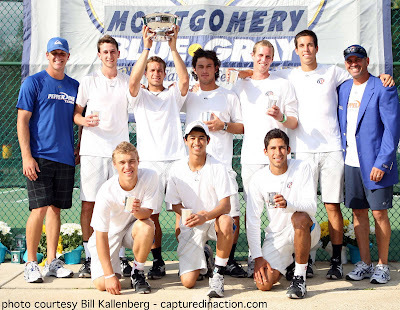 For a complete review of the day's results, see this report from the USTA Pro Circuit. I watched the second round SAP Open doubles match between Stanford's Bradley Klahn and Ryan Thacher and Xavier Malisse and Alejandro Falla this evening via the free livestreaming at veetle.com, but unfortunately it was a lopsided match. Malisse and Falla won 6-0, 6-2, and although I would say that Malisse in particular played brilliantly, Klahn and Thacher never got their games going. Whether it was nerves or lack of experience, the Stanford team missed volleys, returns and first serves and never truly pressured Malisse and Falla. There were only two deciding points, both won by the professionals, and it was over very quickly. It was a much better evening for another recent college player as former Georgia Tech Yellowjacket Irina Falconi took out No. 4 seed Anne Keothavong of Great Britain 2-6, 7-5, 6-1 in the featured evening match at the Dow Corning Tennis Classic. In Friday's quarterfinals, Falconi will play fellow American Madison Brengle who completed an upset of her own this afternoon, defeating No. 5 seed Sorana Cirstea of Romania 6-2, 5-7, 7-5. There are now as many qualifiers remaining in the draw as seeds, with Ahsha Rolle, a 6-0, 3-6, 6-3 winner over Michelle Larcher de Brito and Alexandra Stevenson, who beat Stephanie Foretz Gacon 6-0, 6-7(4), 6-3, earning their fifth victories in the past five days. Stevenson will play No. 2 seed Rebecca Marino Friday. Marino beat 15-year-old Vicky Duval 7-6(1), 6-4, Thursday, but Duval is probably pleased with her improvement in the scoreline, as she had lost to Marino 6-0, 6-1 a year ago in Memphis qualifying. Rolle will play the other remaining seed, No. 7 Ksenia Pervak of Russia. The fourth match will feature 2009 champion and 2010 finalist Lucie Hradecka of the Czech Republic against Germany's Sabine Lisicki. Falconi's win means she will continue to write her blog for usta.com. Here is the most recent edition. For complete results, see the Pro Circuit page at usta.com. The SMASH Junior Cup will take place February 19-21, and it is a sectional tournament with national interest due to the wild card earned by the girls 18s winner. The Family Circle Cup in Charleston, South Carolina awards a qualifying wild card to its tournament in April, with past champions including Mallory Cecil, Alison Riske and Shelby Rogers. This year entries close on Sunday the 13th, but already Kaitlin Ray, Caroline Price, Lauren Herring, Catherine Harrison and Jessica Pegula have entered. For more, see the TennisLink site. And for those of you interested in the Futures, don't miss the recent posts over at Challenger Tennis, who covered last week's Palm Coast event in person and is probably the only person in the world reporting exactly what Wayne Odesnik said after his victory. I'm back home in Kalamazoo, so unfortunately I didn't see Vicky Duval's first win in the main draw of a ITF Women's Circuit event, a 6-3 6-3 victory over 34-year-old qualifier Mashona Washington in the first round at the $100,000 Dow Corning Tennis Classic in Midland, Michigan. Duval, who turned 15 in November, was given a wild card into the tournament, but according to press aide Josh Rey, she was far from overwhelmed by the occasion. Sabine Lisicki, the former Top 25 player who trains with Duval at the IMG/Bollettieri Academy, was courtside to provide support. Rey's account of the day's action can be found here. Duval will play No. 2 seed Rebecca Marino of Canada, who barely escaped an upset at the hands of qualifier Alex Glatch 6-1, 1-6, 7-6(5). Two qualifiers did advance to the second round however, with Ahsha Rolle cruising past No. 3 seed Evgeniya Rodina of Russia 6-1, 6-1 and Alexandra Stevenson eliminating No. 8 seed CoCo Vandeweghe 6-3, 6-2. Sixteen-year-old wild card Jessica Pegula, who reached the final of the $25,000 Pro Circuit tournament in Lutz, Florida last month, put up a good fight against Sorana Cirstea of Romania, but dropped a 7-6(6), 6-3 decision to the fifth seed. Ksenia Pervak (Russia) def. Alison Riske (United States) 6-3, 6-3. Catherine Harrison, the 16-year-old from Germantown, Tennessee, has received a wild card into the main draw of next week's WTA Cellular South Cup at the Racquet Club of Memphis. In this article from the Memphis Commercial Appeal, Harrison and her coach talk about her experience in last year's qualifying at her hometown tournament and her improvement since then. Beatrice Capra told me in Midland, when I spoke to her for an upcoming Tennis Recruiting Network article on her choice of Duke, that she had applied for a main draw wild card for Memphis, and should know by Thursday whether she has been granted it. Last night in the first round of doubles at the ATP SAP Open in San Jose, Stanford's Bradley Klahn and Ryan Thacher, who received a wild card, defeated the No. 3 seeded team of Dustin Brown and Rogier Wassen 6-3, 3-6, 10-5. Tonight Klahn will play No. 2 seed Gael Monfils in a first round singles match, which is second on after 7 p.m. PST. This year the tournament is offering free livestreaming of matches via Veetle.com. Our friend Ken Thomas of radiotennis.com is doing the commentary, and this afternoon I watched a very entertaining match between Ricardas Berankis of Lithuania and Donald Young of the U.S. Young was serving for the match at 5-3 in the third set, but lost four very close games to come out on the wrong end of a 6-4, 5-7, 7-5 score. So for you night owls out there, I recommend the Klahn - Monfils match, which will go on way past my bedtime here in the Eastern time zone. Less than an hour after the four qualifiers were determined at the $100,000 Dow Corning Tennis Classic, the tournament's top seed was sidelined, with Anna Tatishvili of Georgia defeating Varvara Lepchenko of the United States, 6-7(4), 6-3, 6-4. Lepchenko was one of four Americans to fall during the action on Tuesday, with Christina McHale, Jamie Hampton and wild card Shelby Rogers also sidelined in early first round matches. The qualifiers were all veteran Americans however, as Mashona Washington, Ahsha Rolle, Alexa Glatch and Alexandra Stevenson took straight set wins in the third and final round of qualifying this morning at the Midland Tennis Center. Washington defeated Alexandra Mueller 7-6(4), 6-3 in front of several busloads of local students watching from the stadium court "box seats". Throughout the week, area schools send their gym classes to attend the day sessions and hit a few balls on an adjacent court. Rolle defeated Lena Litvak 6-4, 6-2, Glatch downed Amanda Fink 6-2, 6-2 and Stevenson beat Marina Erakovic 6-2, 6-4. Stevenson won the singles title at the Dow Corning Classic in 1998, as an 18-year-old. 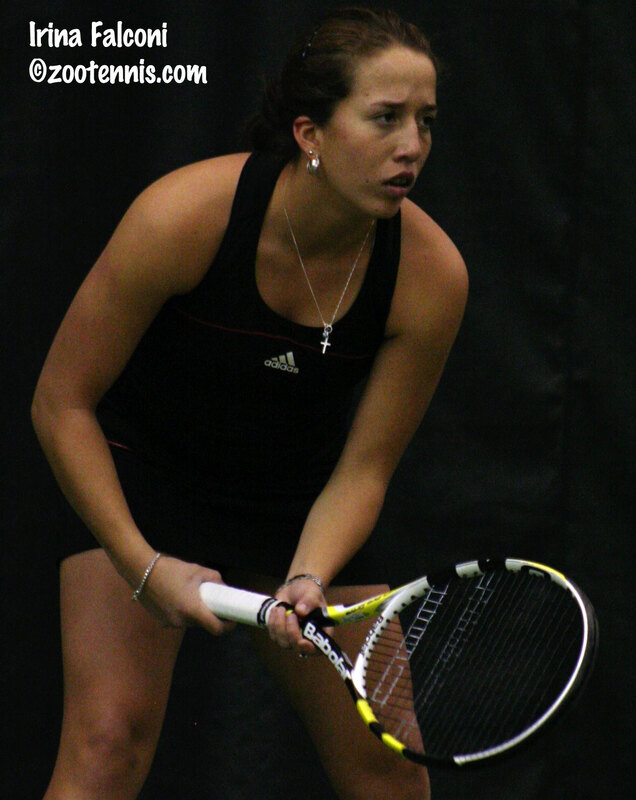 Irina Falconi, the 2010 ITA College Player of the Year, was the first player to advance to the second round, taking a 7-5, 6-2 decision from Great Britain's Katie O'Brien. After getting broken in the opening game of the first set, Falconi was fortunate not to fall any farther behind, as she needed to save break points in her next two service games to stay within striking distance. Serving at 1-3, 30-40, Falconi hit a second serve ace up the T and went on to hold. The 20-year-old then broke O'Brien to pull even, but was immediately broken back, leaving O'Brien with a chance to serve for the set at 5-4. O'Brien's backhand had been excellent throughout the first half of the set, and she was winning the majority of the baseline rallies, but in that key game, her backhand deserted her and she was broken for 5-5. After an easy Falconi hold, O'Brien was serving to force a tiebreaker, but in that game it was her serve that let her down, double faulting on the final two points to give Falconi the first set. In the second set, O'Brien opened with a break, hitting a sizzling return winner with Falconi serving at 30-40, but her service woes continued, and with two more double faults in the second game of the set, O'Brien gave the break back. Another double fault ended O'Brien's next service game, making it 3-1 Falconi, but as discouraging as that must have been for her, she put up quite a battle in the next game, taking Falconi to seven deuces before Falconi held for 4-1. Another O'Brien double fault on game point, her fourth in a row, gave Falconi a comfortable 5-1 lead, but she couldn't close out the match on her next service game, and she too double faulted on game point. O'Brien was broken for the fourth and final time in the next game, but she managed to avoid a double fault on match point. Her first serve missed, but she made her second, only to see Falconi hit a clean backhand winner to close out the match 7-5, 6-2. As I write that match synopsis, it sounds as if it was nothing but double faults, but there were plenty of good rallies, especially in the first set, before O'Brien's confidence and serve disappeared. In the match between Sabine Lisicki and Rogers, I saw only the second set, but I can't recall more than one or two points that were decided in four or more strokes. There were service winners, aces, double faults, ground stroke errors and winners, but there was no rhythm nor any sustained rallies to stitch a narrative around. Lisicki, who was in the Top 25 at this time last year, is still finding her form after many months of injury in 2010, but even when she was not playing her best, she had too much experience and power for the 18-year-old US National junior champion Rogers. In McHale's 3-6, 6-2, 6-3 loss to Anastasia Pivovarova, she may have been lulled into a less aggressive game style than she ultimately needed, when the Russian played a dismal four games to open the match. McHale was ahead 4-0 in a matter of minutes, but Pivovarova was able to drastically cut down on her double faults and forehand errors as the match moved into the second set. McHale, who is usually the epitome of composure on the court, lost patience with herself early in the third set, and in a rare verbal outburst said "I hate this. How can you miss so many balls?" Broken in the first game of the third set, McHale was fortunate that Pivovarova threw in a rare bad game in the next, committing four unforced errors to be broken at love. But McHale was broken at 2-2 and Pivovarova didn't make that same mistake again, holding in her next two service games and taking the match on a McHale double fault. In the night match, which was played after I left to return to Kalamazoo, 2009 Dow Corning Tennis Classic champion Lucie Hradecka of the Czech Republic beat Hampton 7-5, 6-4. Complete results can be found on the Pro Circuit page at usta.com. And Irina Falconi's tournament blog can be also be found at usta.com. She's one of the most entertaining bloggers out there, so make sure you read every installment.